We are the leading manufacturers and suppliers of the Traditional Maang Tikka. 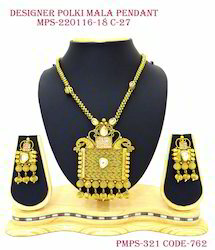 With an aim to stand tall on the expectations of our esteemed clients, we are actively committed towards offering a wide assortment of quality assured Ladies Passa Set..
- Occasion: Anniversary, Engagement, Gift etc. (indiacz)Indian Manufacturer of Pretty Look Combo Jewellery. We Manufacture this EARRING TIKKA on make to order basis choice of metal polish & colour of stones available. Presenting our latest creation in Fabric & Textile Jewellery with a boho touch adorned with Traditional fabric pieces and German Silver motifs. The range comprises of 50+ Unique Designs. Each set comprises of a Necklace and Earrings pair. chunky jhumka tikka set, bridal earings , wedding jewellery accessories antique kundan jhumkas , traditional indian jewellery, ad jhumkas , fancy earings , chandelier earings . - Beautiful Juda , studden With Cz And Semi- Precious Stone.